I am about to start a job in Troy, Id like to find out the best way to bike from mid-town Albany to downtown Troy. A novice could also include someone generally comfortable with riding a bike, but new to riding or racing a road bike. In those instances, you would like a little more open road where you can comfortably get up to speed and execute a workout without having to be as aware of pedestrians or cars. In that case, I would add the Harriman State Campus (inner loop) to the list. After 5:30pm on weeknights and all weekend long its devoid of cars and full of bikes. @Steve B - the "best" way is too subjective. I'd start by heading downtown by either Clinton or State (or one of the mapped secondary/side street routes linked here might be your preference). Then you basically have the option of the bike path or Pearl/Broadway/32 north. NYS Bike Route 9 utilizes the bike path and Broadway from Albany to Watervliet, and crosses the Green Island Bridge into Troy. @Sean - my interpretation/assumption is that the project is intended more for transportation routes than recreational routes. 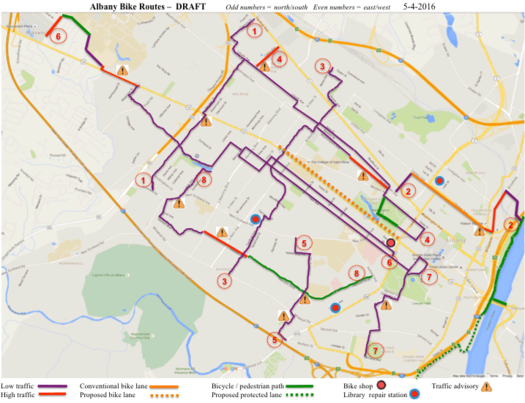 There are many resources out there for recreational riding (ride-mapping sites, for example) than for transportation, and I think to serve its (assumed on my part) purpose best, it would be good to avoid watering the Albany Bike Map Project down with purely recreational options. But I think you make a great point; maybe a parallel project can be developed?